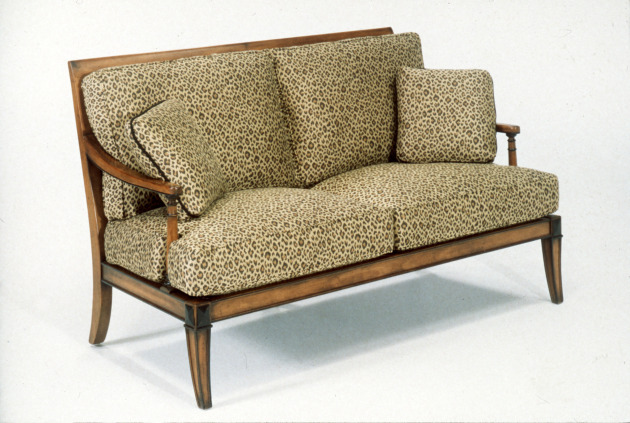 Sofas: How old is too old? In furniture years -- which are a lot like dog years -- our sofa is a very old lady. She just turned 20, and she's definitely showing her age. Her cherry legs are still shapely but scuffed and scarred. Her upholstery is dull and faded, so worn by wear that it's torn in a couple of places. When I ordered her, direct from the manufacturer in South Carolina, the rep assured me of her longevity. "You'll be tired of that fabric long before it wears out," he said of the high-grade tapestry I'd chosen. That turned out not to be true. I still love the fabric, but two kids and three dogs have definitely taken their toll. I'd even consider reupholstering in the SAME, EXACT pattern -- if it was still available, which it's not. The frame is in perfectly good condition. Its style is old-fashioned -- with a high curved back and rolled arms -- but it was old-fashioned even 20 years ago, so I tell myself it's timeless. I hadn't realized how tattered and shabby she was looking -- until our 22-year-old daughter, who's now furnishing her first grown-up apartment, discreetly suggested that it was time for us to put the sofa out of its misery. My husband and I tend to treat furniture like cars, i.e. we run them into the ground and replace them only when absolutely necessary. But I guess 20 is awfully old for a sofa. A few years ago, in 2006, the average life expectancy for a "good-quality sofa," according to a survey of prospective furniture buyers, was 7.8 years, down from 12.1 years in 1996 and 14.2 years in 1985. I found those stats while researching a story about the trend away from heirloom furniture and toward "disposible" pieces. That trend probably slowed during the recession, when few people could afford to replace dated yet still functional furniture. But there's no denying that more people today consider furniture a short-term style statement rather than a long-term investment. How long do you think a sofa should last? And how long do you typically hang on to yours?